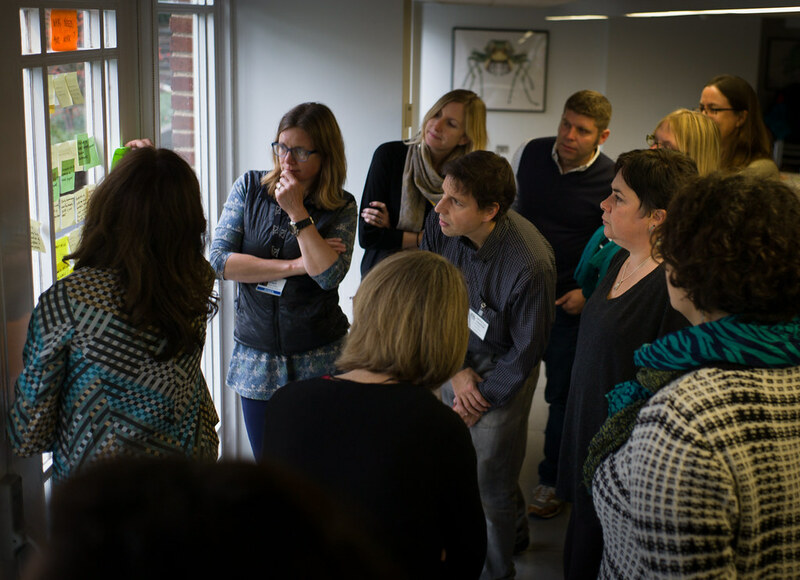 The last Marine CoLAB workshop in 2015, held at the London Zoo on the 25th of November. Louisa Hooper compared it to standing at the seashore at low tide, with rocks and mud emerging from under water, when we can begin to see the peaks, as well as what lies beneath. One of the biggest challenges for this workshop and the year ahead is how to work more effectively with the resources available. The importance of keeping the big picture visible was emphasised, alongside the practicalities of projects, activities and campaigns. In the morning the participants focused om Marine CoLAB as a whole. Beginning with a reflection on Marine CoLAB so far, looking at what has worked and what needs more work. Grounded in this experience they moved into a visioning process lead by Giles to clarify the Marine CoLAB vision and mission. At the end of the morning Sue took the group through a beautiful presentation and discussion of a values based approach, as a lens that can be used to shape and evaluate projects, experiments and the initiative itself. 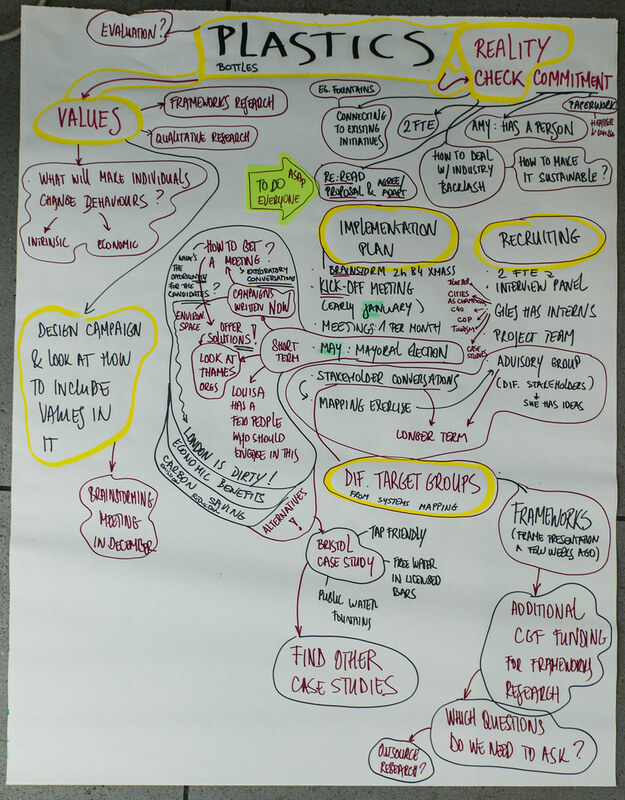 In the afternoon, the focus shifted to the Marine CoLAB project incubator, beginning with a broad mapping of existing and emerging projects by participating organisations which could be relevant to Marine CoLAB facilitated by Aniol. Two following sessions discussed the projects that emerged from previous workshops: possible directions for GameOn guided by Sandy and a working/planning session for the Plastic Bottles project lead by Heather. The day ended with a session about the future of Marine CoLAB in 2016. 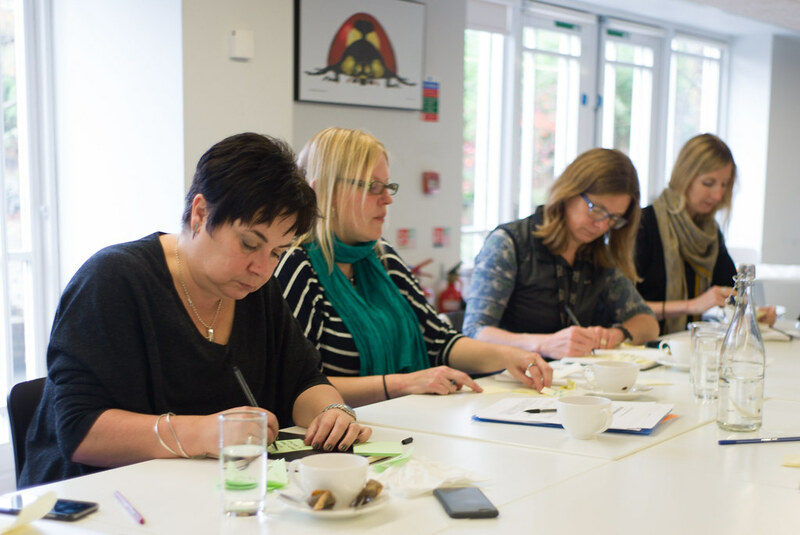 Louisa Hooper, Heather Koldewey, Sandy Luk, Nicola Frost, Amy Pryor, Aniol Esteban, Giles Bristow, Sue Ranger, Mirella von Lindenfels, Sarah Ridley. The morning began by distilling a few points from previous discussions on the future of Marine CoLAB which can be used as a starting point or a point of discussion about Marine CoLAB in 2016 and beyond. 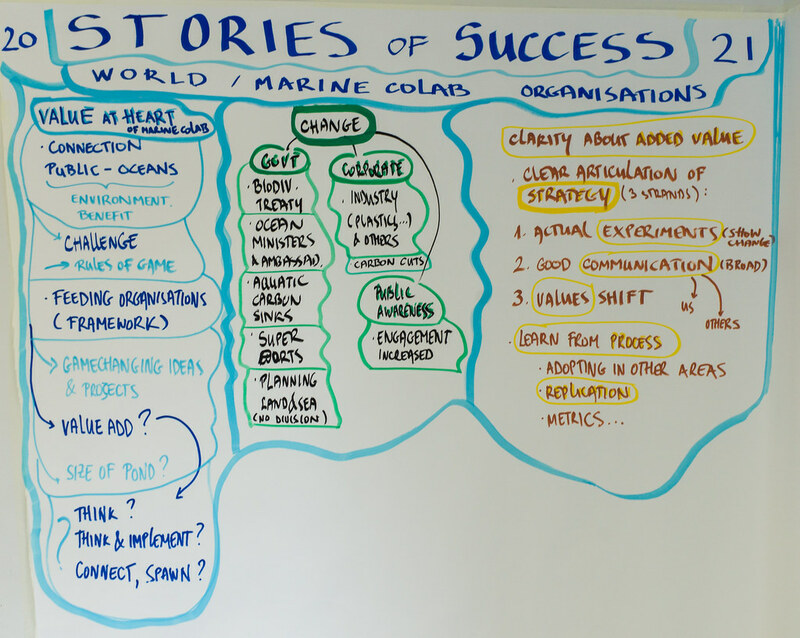 Marine CoLAB participants are keen to seize opportunities, to re-frame challenges and refresh whole systems. They do this by being a part of trusted collaborations and networks. After a year of working together, the facilitators added that the participants are very keen to- and good at designing and working on projects. At the very first workshop the participants designed a range of possible future scenarios for Marine CoLAB and the worlds in which it could exist. The different futures had two things in common: Marine CoLAB would be integrating values and innovation, as well as establishing and strengthening connections (between the ocean and society, between business and governments, bridging the gapes between local and global governance of oceans). Over the course of several workshops, a range of challenges for Marine CoLAB were identified, including systemic change, public engagement, valuing (cultural dimensions) of oceans, perception of marine conservation, transparency of marine industries and plastic pollution of oceans. The facilitators observed an additional challenge: developing a sustainable support network beyond and in-between projects. This is something that began to be addressed in Lisbon and continues in this workshop. Finally, before delving into the futures, mission, values and a range of experiments, projects and activities, we reminded ourselves of the CGF’s goal for Marine CoLAB: To communicate the role of the ocean for human wellbeing (particularly connecting natural sciences and economy). Supportive and energising group of people; Imaginative, energetic, energising and funny; Respectful; Genuine and committed people; Passionate, focused and willing to put in time when required. Finding a common project (e.g. Plastic pollution) to get our teeth into a specific challenge, that uses existing skills and interests - sum bigger than parts. Facilitators: Support, facilitation and advance planning; facilitators help to keep on track; Capturing and documenting of what happened. Communication between meetings; time to do things and connect between meetings (though it is happening); Embedding CoLAB work between workshops - often a last minute flurry of preparation for each one. Connecting beyond the LAB, both with LAB organisations and other orgs. Get better at knowing “who we are, where we go and how we do it”. Think about the structure of the collaboration and how it could overlap with organisational missions, activities and strategies. Core funding is likely to be needed for Marine CoLAB as a whole, as some of the organisations are only funded on a project basis, so do not have the capacity to offer people’s time. While it is important to get Marine CoLAB projects funded, the benefit of the collaboration needs the CoLAB as a whole funded as well. 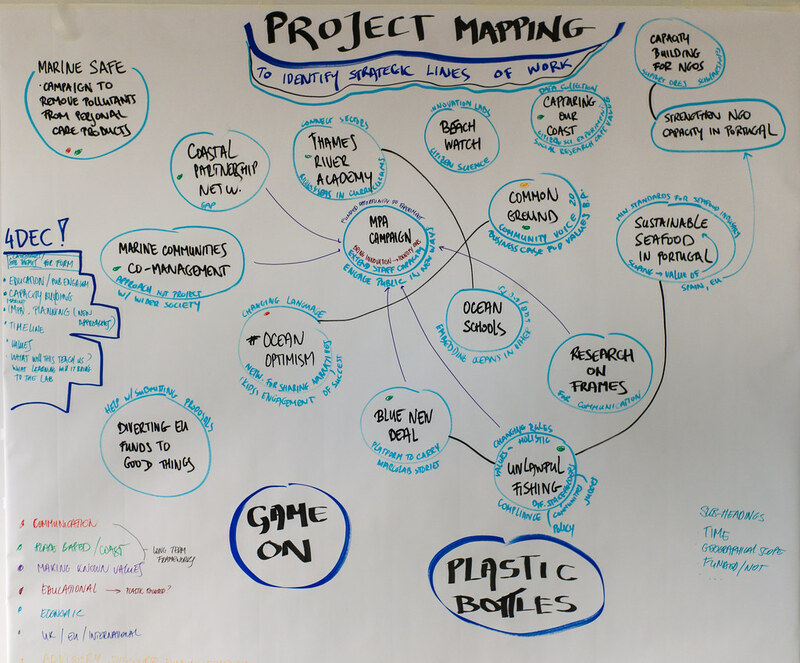 Create a thought piece explaining something like “this is the benefit of 12 months of Marine CoLAB”, using the plastics project and other key outcomes as milestones. Communicate how Marine CoLAB affected ways of working, what effects it had on specific projects, potential long term value for oceans, etc. Value is at heart of Marine CoLAB, connecting the public with oceans and increasing the environmental benefit. Value is also a challenge for Marine CoLAB, defining the rules of the game. 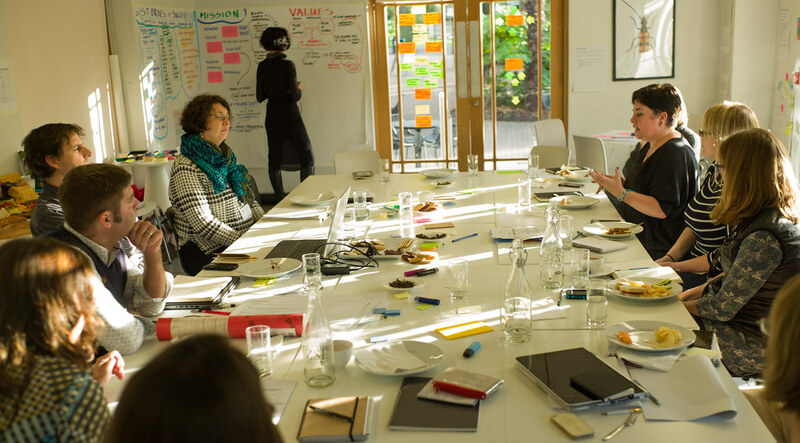 The CoLAB is a framework that feeds the organisations involved with game-changing ideas and projects. It isn’t quite clear what the size of its pond is, but it is likely that its purpose is to think, or perhaps think and implement, more likely to connect and spawn initiatives rather than do everything itself. Marine CoLAB perpetuates change in three areas: governmental/governance, corporate and public awareness. In 2021 Marine CoLAB made the new biodiversity treaty possible, the planning of land and sea is integrated, there are now ocean ministers and ambassadors, aquatic carbon sinks have been established and new super-ports are operational. In the corporate arena Marine CoLAB was involved in successful collaboration with industries (plastic and others) and the world has seen significant carbon cuts. In terms of public awareness, the widespread and mutually beneficial engagement of people with oceans is increasing due to Marine CoLAB’s persistent efforts. Actual experiments that show change; including learning from the process, replicating and adapting experiments to other areas, developing metrics, etc. Marine CoLAB is a network focused on values based solutions to protect and restore the ocean. We exist because a collective is a powerful means to address the urgent need for humans to value the ocean and drive change. We aim to achieve a shift in how the ocean is valued by individuals and society to improve ocean health. We tackle these issues by collaborating, incubating, innovating, catalysing and influencing. Glue: values based → USP → what is the BIGGER SHIFT the lab wants to focus on (e.g. climate change, fossil fuels and oceans - a big goal to strive towards)? What are the relevant values for this goal? As a lab, how do we experiment with strategies? Is it economic transformation the Marine COLAB is looking for? Perceptual shifts, cultural change, or something else? Recognising and amplifying values: the CoLAB needs clearer ideas for methods to 'amplify' existing values. Behavioural change can be a result of recognising, uncovering & understanding existing values, as well as finding where values of oceans and people are at odds and experimenting with ways to make them not at odds any longer. Changing values: a more pro-active process, although perhaps an impossibility - possibly better to focus on changing behaviours instead. To do in 2016 → look at values based campaigning Chris Rose and also NEF’s approaches. Giles to compile a proposal for a mission statement based on these reflections and the materials from Lisbon. There is a need to find a language all Marine CoLAB participants understand, paying attention to jargon. There is a difference between the term “values” and “value”, both are part of one whole, but can be understood quite differently. Sue’s presentation focused on values that connect people and places. What is important in a place? Values are developed through experience and interaction, and form the heartfelt connections between the people and a place, adding to human wellbeing. From these connections “cultural ecosystem services” beyond monetary value can be developed. They include a wider context, create whole ecosystems of interconnected disciplines (e.g. conservation, economy, mythology, wellbeing…) and incorporate different ways of talking and telling stories about a place. They deliver benefits to human wellbeing and are connected to other ecosystem services. In order to uncover deeper values, we need to start with basic connectedness (of people and places, different disciplines…). This can form a glue, a common basis and shared understanding. The values based approach is the hallmark of Marine CoLAB, a prism or lens through which the LAB and its activities are designed and assessed. Filling the gap between the values of humans and the value of oceans. The value of oceans tends to be misunderstood and needs to be communicated differently. An iconic campaign might help, as well as focusing on issues by describing the value of oceans, such as the plastics project and other values based experiments, that would include learning, capturing, evaluation, etc. There are different methods to approach values, depending on the theory of change applied. Should Marine CoLAB have one or more theory of change? Is there a generic TOC or a range of context specific theories that can mobilise new voices and gather evidence? Is the uniqueness of Marine CoLAB’s TOC important? Would it not be more relevant to focus on adding value? What are the values of Marine CoLAB? Could shared values be Marine CoLAB’s focus at all times and across all projects? Is there a spectrum of existing values that are shared (instrinsic/extrinsic, economic & cultural, individual & collective, etc.)? 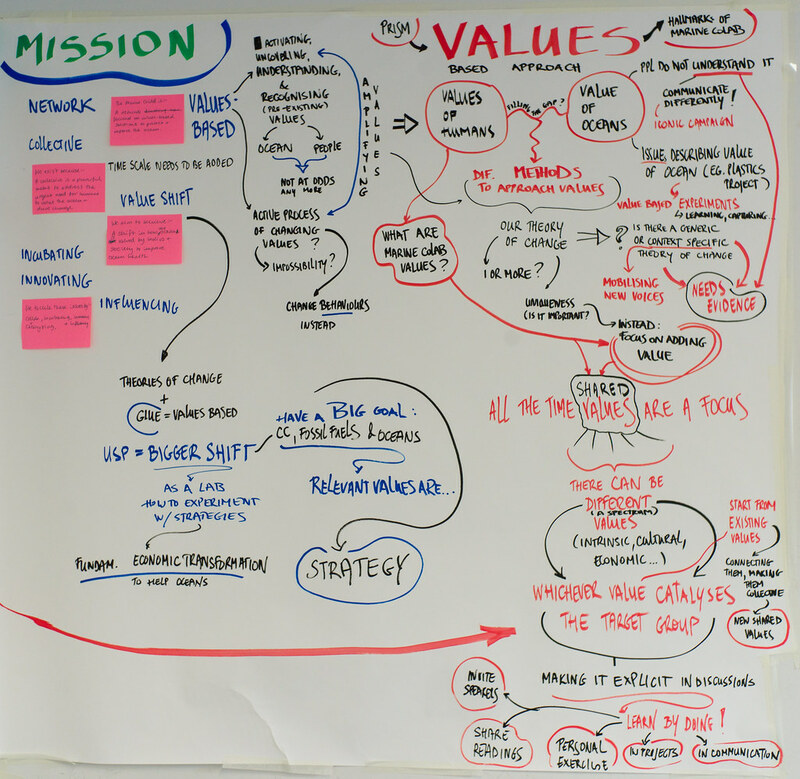 By working with a range of different values this approach can focus on whichever value catalyses different target groups - starting from their existing values, connecting them to oceans and each other, making the values collective and shared. How to begin using a values based approach in Marine CoLAB: learn by doing! Blue New Deal, a possible platform to carry MarCoLab stories. Coastal Partnerships Network, a possible vehicle for MarCoLab initiative trials, information dissemination and feedback nationally. UK Marine Planning is about to create opportunities for Coastal Partnerships to become individually more robust and realise ambitions for Integrated Coastal Zone Management. There are opportunities for the MarCoLab to play a central role in shaping the future of Coastal Partnerships and management on UK coasts with values at the heart of it. Thames river academy (educational projects) across different sectors, using rivers and seas as the bedrock of the curriculum and active environmental projects as the basis for transferable skills training. Coastal Partnerships Network currently the Network is run voluntarily but there is a push to create consistency across each Coastal Partnership whilst retaining their local focus and delivery. Capacity needs to be built nationally to ensure marine and estuarine health is at the heart of all local development and economic decisions. The ambition is that each Coastal Partnership plays a neutral, honest broker role to ensure all sectors are involved in coastal management. Challenge: “how can we change perception of the value of oceans through digital media?” GameOn is an experiment to test the hypothesis that it is possible to do this by developing games or influencing game developers. Several ides have surfaced, all with challenges and opportunities. The common challenge for all is deciding how and when to engage the pubic in the process, and who the target audience is (children, gamers, game developers…). It remains interesting to look at ways to make conservation games more mainstream, while at the same time focusing on awareness and education. There are many possible partners, but the CoLAB needs specific contacts and entry points to the games industry. Influence game developers: develop best practice guides, become a “one stop shop” or “think tank” for film makers and game developers… This approach would encourage leadership in design communities related to connecting transmedia stories to the value of oceans. Coached lab session or “challenge workshop” to develop (mini) game(s) and/or app(s) and add-ons to games, with different stakeholders. There is a possibility to conduct this experiment at ZSL, similar to 'fish hackathons'. The focus is on the process (journey) and education of diverse participants. Through the journey of a lab development session the participants create simple experiments to test the ideas and if successful, find ways to scale them. 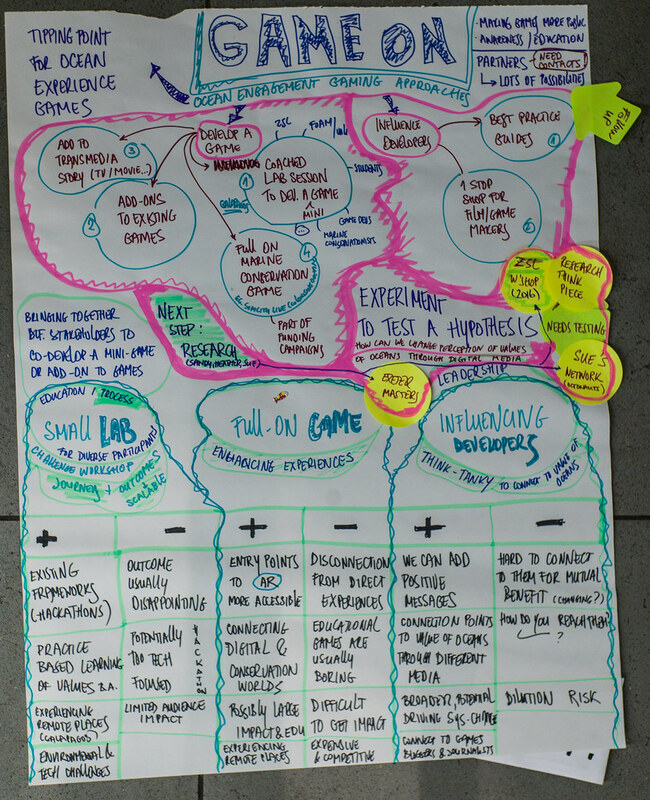 Develop a full-blown mainstream marine conservation game, e.g. a ’simcity-like’ versions of initial scenarios (from Workshop 1, or SIM_MPA (cf. beyond (..?) rising tide - maxis?). The interesting aspects of this approach is to enhance both digital games with marine content and experiences of oceans for the gaming community (e.g. using augmented reality). Disadvantages: does developing a mini game in a lab actually 'work' as a way to develop connections to the oceans? Hackathon process can be too technology focused, the outcomes can be lacklustre, with limited audience impact. Disadvantages: Hard to reach and connect this target group for mutual benefit (though this is slowly changing); Nemo effect' (clown fish), Disney often difficult to work with, span of control is extended, possible dilution. Sue/MCS, probe existing contacts (Octonauts) as potential test audience. Working session of the now fully funded (CGF & OAK Foundation) Marine CoLAB project: campaign to make London free of Single Use Plastic Bottles. What will make individuals change behaviour (intrinsic, economic…)? How to avoid industry backlash? how to ensure 'best advice' is maintained, front of house role? Design campaign to include values as an essential part of it: continue discussion at the brainstorming meeting in December. How to explicitly test values based research? By 11 December 2015, All: Re:read the proposal, agree on commitments and/or adapt if needed. How to get a meeting? Exploratory conversations to identify what is the opportunity for the candidates. Offer solutions/alternatives: economic benefits, carbon emission reduction, making London less dirty…. Outsource research: to e.g. frameworks research - additional funding will be available for this research from CGF. Which questions need asking? Link to related initiatives, e.g. “fountains for the future” project link (roll out in summer 2016), connections with existing NGOs working in 'plastics space'; e.g. Emma Cunningham re. stakeholder interviews, industry, NGOs, etc. Establish list of allies, existing contacts and relevant conversations, meetings required. Research any upcoming 'big things' to connect to (world cup, etc) esp. positioning for London? 10 days of time per organisation is covered by CGF core funding for Marine CoLAB. How best to structure the time? What does a lab community look like? Further work required on values, strategy, project updates, planning, evaluation. How can new/other partners get involved in the future? Strategy for engagement? 07/12 Fill in the Project Incubator Form. 11/12 Re-read the proposal, agree on commitments. 16/12 Plastics project working meeting (Marine CoLAB only). → Let Heather know if you’re coming. e.g. How did it affect ways of working, key outcomes for you, effects it had on specific projects, long term value etc.